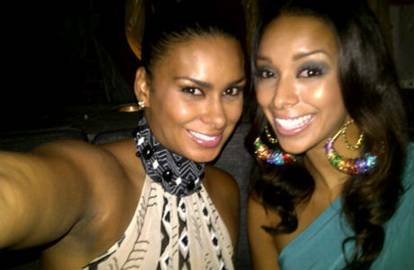 *Sisters Gloria Govan Barnes and Laura Govan are looking to show what a real NBA wife’s life is like with their own new reality show. “We’re working on a family show: me, my sister, Gilbert [Arenas], Matt [Barnes], you know all of our kids. You know my sister’s got like 18 kids. It’s really four, but it feels like 18 because they’re all over the place. We’re doing a lot of stuff that we’re doing together, which is really cool,” Gloria joked with TheJasmineBrand.com. The sisters were first introduced to the world on season 1 of “Basketball Wives” but after Gloria butted heads with many of her co-stars, the two ended up on the L.A. spin-off. Star of “Basketball Wives” and producer Shaunie said season 3 of the spin-off required a “facelift.” Many people are saying Gloria and Laura didn’t survive the makeover. In March, Gloria told HipHollywood.com that she was about done with the series anyway. “When the time is right, I think it’ll be about time for me to leave that show,” she said. Unlike “Basketball Wives” which tends to focus on the ladies’ relationships with each other, Gloria said the new show will be about their families. Good to seee young ladies venturijg out to do their own thing..f youever make it to baltimorei would love to do a walk and talk photoshoot session….sincerely jeffery! What a waste….if you watched the reunion no one wanted them back so who in their right mind would want to watch a show just about them….way to waste money! I would rather watch paint dry! That’s funny!! I read your post after I posted my comment. We both would rather watch paint dry! Lmao Now that’s bad!! I think a lot a women are jealous of the Govan sisters. So much hate!!!!! !learn to love yourselves!!!!!! I’m glad they are gone and won’t watch their spinoff. They are annoying.